Gibraltar is a brilliant day trip from southern Spain or Morocco (a mere ferry ride away), but don’t forget your passport because you’re going to Britain! A British Overseas Territory, known for tediously long border crossings, Gibraltar is certainly unique, some might even say it’s a bit weird. Famous for its massive Rock, Gibraltar has a fascinating history that involves military might and ancient human-types. If staying in Gibraltar, be sure to balance your exploration time with relaxation time as you are at the mouth of the Mediterranean, after all. A British Overseas Territory bordering Spain, Gibraltar is a headland attached to the South of Spain. Gibraltar shares the Bay of Gibraltar with Spain and is across the Strait of Gibraltar from Morocco. Gibraltar has 12 kilometres (7.5 miles) of coastline. Food You Must Try: Calentita is a flatbread or pancake made from chickpeas, water, olive oil, salt and pepper. A relatively new site, Gibraltar’s Gorham’s Cave Complex received its designation in 2016. Together with the Gibraltar Nature Reserve, the 28-hectare site comprises over 40% of Gibraltar’s territory. The Cave Complex is a well preserved and essential site of archaeological significance; demonstrating Neanderthal and early human life. Evidence from this site shows that Gibraltar was the last habitable place for the Neanderthals. Be sure to spend some time with the interpretation panels to learn more about the many discoveries and ongoing mysteries connected to ancient human occupation here. You can ascend the Rock of Gibraltar three ways: by walking up (a steep and potentially challenging climb), taking the cable car, or hiring a tour guide. 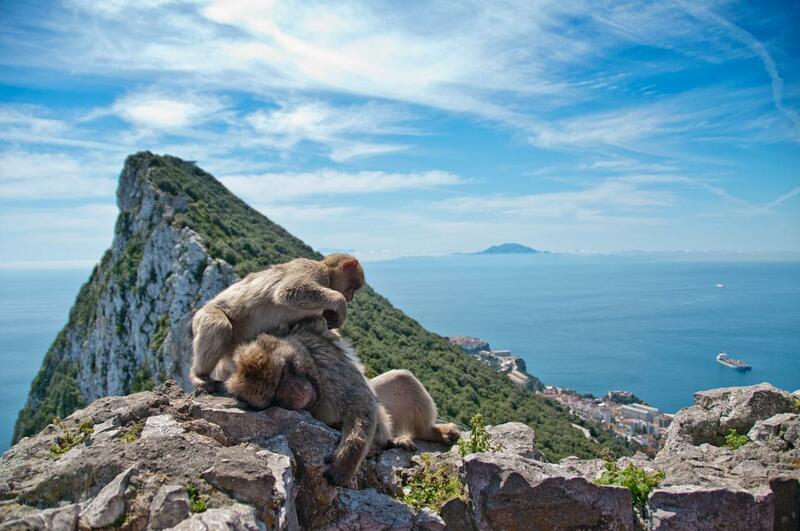 We opted for the tour (price included entry) and were not disappointed as our experience of the top of the rock also included the Pillars of Hercules, St Michael’s Cave, the Great Siege Tunnels, and an up close and personal with Gibraltar’s unique Barbary Macaques. The guide we hired grew up in Gibraltar and impressed us with his knowledge of each site and the monkeys. No matter how you get to the top, the awe-inspiring view of Africa is worth the journey. Explore the Nature Reserve Paths with the help of an app available via the Gibraltar Tourist Board. If you’re day-tripping to Gibraltar, it’s likely that the Rock will take up the bulk of your time visiting. If you’re staying for a few days, however, be sure to spend some time relaxing by the sea. Gibraltar has six beaches which all provide a spectacular view (you are at the mouth of the Mediterranean, after all). Be sure to do your research as some of the beaches are sandy and some are rocky; there are lido pools at the rocky beaches to make your swim more comfortable. Gibraltar is home to the most southerly mosque in Europe, Ibrahim-al-Ibrahim Mosque built on Europa Point. During Franco’s leadership of Spain, the border was closed and the Spanish forced to vacate the Territory. Workers came from North Africa to fill the gap, working and living alongside Brits and Gibraltarians. It was only in the late 1990s that Muslims in Gibraltar had a formal religious centre, gifted to them by the King of Saudi Arabia, and including a library, school, and lecture space. Europa Point is also home to a 19th-century lighthouse, Catholic chapel, and military infrastructure, making for a landscape with diversity. A site with such archaeological and anthropological importance, it makes sense that Gibraltar’s museum is an essential item for your itinerary. Established in 1930, the museum boasts exhibits from ancient, modern, and contemporary Gibraltar to tell the story of this unique place over millennia. Natural, sociological and military history are on display here, including a well preserved Moorish bathhouse that was once used as a military stable. Fans of history must spend time exploring the Moorish Castle. Although it is not the most well-preserved example of Moorish architecture, the unique history of this site is due entirely to its location in Gibraltar. The Moors occupied the area we know as Gibraltar the longest, over 700 years. These fortifications were constructed in the 12th century (or earlier) and were destroyed when the Spanish took Gibraltar in the 14th century. Rebuilt by the Moors when they reconquered the territory, the Castle is generally in poor shape. One area of the complex has remained functional enough to contain the Gibraltar prison until 2010. Visits to the Castle are included in the Nature Reserve admission fee. Gibraltar is so small it only has 29 km of roads – ranking it third in the least amount of road after Tuvalu and Cocos Islands. Perhaps more surprising is they drive on the right, unlike Britain. The only airport runway crosses the Territory’s busiest road (Winston Churchill Avenue, of course) requiring the road to close whenever a plane is coming or going. The official language of Gibraltar might be English, but the territory has its own dialect. Llanito is a blend of Andalusian Spanish, British English, with some Ligurian, Maltese, and Portuguese sprinkled in. Famous visitors to Gibraltar include John Lennon and Yoko Ono who got married there, and Prince Charles and Princess Diana who went there on their honeymoon. 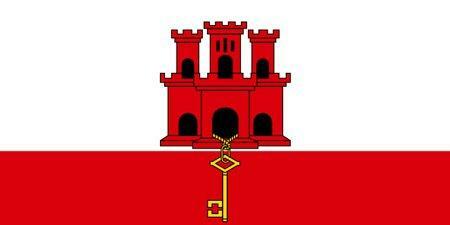 Gibraltar has the 5th highest population density in the world with 4559 people per square kilometre. 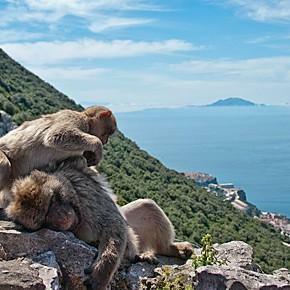 It is said Gibraltar will remain British so long as the Macaques remain in Gibraltar – Churchill, faced with a dwindling population of monkeys on the rock, had some imported from across the Strait. Gibraltar is linked to Greek mythology as one of Hercules’ pillars – the other is located 24 kilometres across the Strait of Gibraltar in Morocco.